ELVEN GRACE: This hero is an Elf, takes significantly less damage from CRITs, and deals 2x damage to flying enemies. BRIGHT SHOT: Ranged Physical attack on target enemy with 100% base chance to blind. HAIL OF ARROWS: Ranged Physical Attack on all enemies, applying Off-Balance and purging all buffs. BRIGHT AURA: Other Allies Ranged Physical attacks have a chance to Blind on hit. DARTING DEFENSE: Ranged Allies take 25% reduced damage from basic and epic attacks. COMMANDING PRESENCE: Ranged Spirit attack on target enemy with 100% chance to paralyze the target. Allies gain 1 energy. EXCEPTIONAL ARSENAL: Allies gain an additional 20% chance to trigger an epic attack. HIGH COMMAND: Ranged allies start with 2 stacks of Command. Whenever this hero uses a special ability, all ranged allies with a stack of command perform the same ability on a random enemy. (1st ability with their 1st ability, 2nd ability with their 2nd ability, etc.) Can't be stolen, copied, or purged. 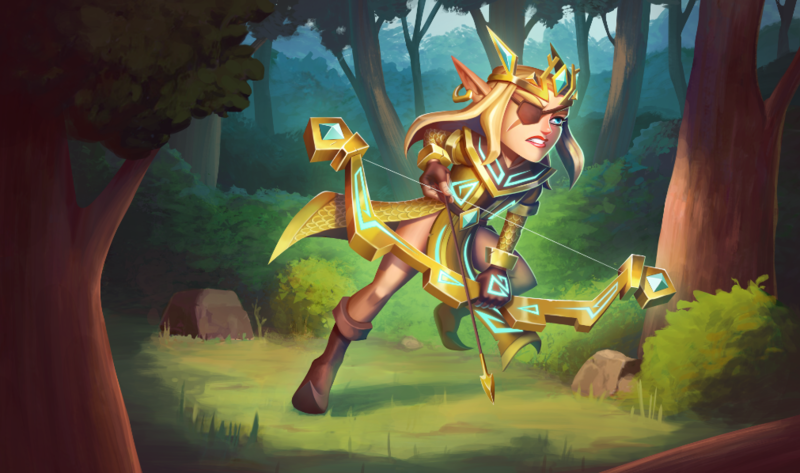 AMBUSH TACTICS: Ranged Physical attack on target enemy, and all ranged allies attack the same target, then gain stealth and invulnerable for a turn. Ability starts powered. Wow GREAT job on the hero card and model. She is one of the best looking new characters you guys have released. Won’t be able to use her (absolutely would for the epic proc thing) because I can’t get her starred up. I am just waiting for wizards that each wizard represents a different element. why we need new skills if pandas silence and dwarfs endless attacks don't give a chance to use them lol? Oh boy, just what everyone wanted, another legendary hero that will only collect dust for the fact that she will be impossible to fully ascend for 98% of the player base. Please excuse my excitement that definitely isn't sarcasm whatsoever. But for all seriousness though, what the actual crap is going through your guys' heads? All you're doing is making another hero that will force people to choke out their wallets in order to properly invest into for the third time IN A ROW. In fact, out of the six most recent heroes, five of them have been legendary, FIVE out of SIX! This cash grab is so blatantly obvious that it's almost insulting that the Dungeon Boss team has continued time and time again to steal money from the wallets of their players. I've been trying so hard to stay positive about this game's future, and that maybe the'll fix the issues that currently plague the game. However, as of now, any optimism that I had only a couple months ago... is dead. I'm gonna give this game one (maybe two) more update(s), and if the issues that currently plague the game aren't fixed, then I'm uninstalling the game, and will most likely leave this forum too. This corporate greed has gotten out of hand, and something needs to be done about it NOW! If they can't rush out an update to fix the issues, then at least give us an announcement telling us DB's future plans for the game and how the problems will be fixed. Most of us have been assuming that you guys are just gonna continue to double down on the greed. If there's ever been a time to prove them wrong and show that you still care, that time is NOW! Not later, NOW! If you don't plan to fix the issues however, then I hope the money was worth it, you greedy pigs. Reyla is way to op fully ascended. It is impossible to beat a Reyla team unless you are also using a Reyla team. Btw if you want to be heard you are probably gonna have to join the DB discord channel.